Last week, I created an iPhone app out of my blog in ten minutes at a cost of $50 using a service call AppMkr. It made wonder when we'll start to see more iPhone apps from and to benefit nonprofits. Almost a year ago, Britt Bravo compiled an iPhone Apps for Nonprofits list. She looked far and wide, but the list was small. It included one of my favorites, The Monterey Bay Aquarium's Seafood Guide to help you make, "sustainable seafood choices." Britt also mentions that The Extraordinaries was just about to launch its iPhone application to help people find 20-minute volunteer opportunities. Put another way, an iPhone application to put thumbs to good use. This application can now be downloaded here. Another iPhone application is Give Work, a collaborative effort by CrowdFlower, a professional crowdsourcing service provider, and Samasource, a non-profit organization that trains youths and refugees to use computers, and by extension to find sustainable employment. The application creates an opportunity for Kenyan refugees by matching iPhone users' volunteer work with that of the refugees, who do the same tasks and are paid double. The Extraordinaries has also been doing a good job of tracking nonprofit iPhone apps over at their blog. You'll find reviews of iPhone apps from the Olympics, National Center for Missing Children, the San Jose Museum, and others. One of the more exciting iPhone apps to appear in the last month or so is CauseWorld that uses a new form of "embedded" giving that I dubbed "Foot Traffic Philanthropy." I had a lot of fun playing with the app over the holidays and generation donations to a handful of charities. Meanwhile, FourSquare, a location-based app, is experimenting with leveraging donations with its leaderboard. Recently, Heather Mansfield at the Nonprofit Tech 2.0 Blog, mentioned that Causeworld and the Extraordinaires were two of three iPhone apps that every nonprofit should know about. 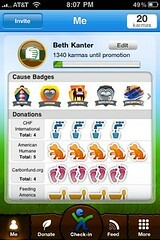 The third app was called "Charity Finder" that lets user donate to nonprofits via simple interface. While Heather describes as the app as experimental, she envisions that it is only a matter of time before we'll see Network for Good or other charity listings service as an iPhone app. What iPhone apps have you come across from nonprofits or charities or help raise money? These are great, Beth. And I really like how easy it is to create your own out of your own blog. 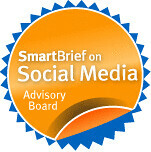 You just inspired me to create one for our blog too with AppMkr. Also a BIG fan of the Extraordinaries, and glad to see their cutting-edge work getting attention. Another app to check out is actually one w just released it today at the Sunlight Foundation (and are pretty excited about). It's called "Real Time Congress" and the idea is (as its name implies) that you can get real-time information about what's going on in Congress - which for any advocacy professional or campaigner can be really crucial information that's often hard to get. Now you can get it in your pocket! It's free, which we love because to get this information in real time previously, you had to shell out lots of money (which typically only lobbyists could afford). Hope it's useful for the community out there! Thanks, as always, for keeping us all on the edge of what's possible with and getting important information to us in the palm of our hands. As someone who works in fundraising, I find the cost of entering the micro-donations field a little daunting. mGive has a pretty hefty upfront cost I've discovered and can't seem to find any SMS or mobile application that can be suggested to patrons as a way to make a direct donation. Any suggestions? Funny you just posted about this. Because, a couple of days ago I launched a "Mission" at The Extraordinaries that asks the community to help find nonprofit iPhone apps. It uses our new "Researcher" tool - which allows a bunch of people interested in the same thing to do research together. Check it out and please submit your findings! I recently downloaded the DoGood (http://mobil33t.com/dogood/) iPhone app from Mobil33t. They wondered what would happen if 300,000 people did the same act of kindness everyday. Interesting question and an interesting app. Each day you get on very doable dogood to do, e.g. be nice to a stranger. Seems like a great way to get those who are new to doing good to get the feel for it, as opposed to an avenue for nonprofits to raise money, but it'll be interesting to watch what happens with it. Am now going to download all the other apps you mention that haven't yet made it onto my iPhone! Thank you for mentioning the Monterey Bay Aquarium’s Seafood Watch app. For me, the exciting thing about the Extraordinaires is the step it’s taking towards an eventual integration between apps and web services developed by different organizations. This is key as organizations compete for space on people’s phones.